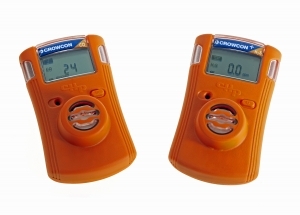 The new Crowcon Clip and Clip+ single gas monitors are simple to use and designed with one thing in mind: compliance with regulations and company procedures in the oil and gas industry. Intended for use in hazardous areas, they offer reliable and durable fixed life monitoring in a compact, lightweight and maintenance-free package. Application focused innovations allow hibernation, deliver industry leading alarm time, changeable alarm levels, as well as user friendly gas test and calibration solutions. Suitable for non-specialists such as contractors during shutdown/turnaround, the Clip and Clip+ monitor for hazardous gases such as hydrogen sulphide (H2S) and carbon monoxide (CO), ensuring workers are protected at all times, whether they are involved in exploration, production or refining. With more than 2900 alarm minutes, both the Clip and Clip+ offer a full year of shelf life followed by a two-year run time which includes four minutes of alarm time per day of operation. This ensures that even when a monitoring is regularly gas (bump) tested, or enters alarm whilst in use, the battery still has ample capability to last the two year product life. The Crowcon Clip+ also includes an innovative hibernate facility, allowing full monitor shutdown for times when not in use – very useful for shutdown and turnarounds when site population drastically increases. Single button operation maintains the simplicity of the monitor. Once activated, the operator button can be used to run a self-test (demonstrating audible, visual and vibrate alerts as well as running internal electronic diagnostics) or show the alarm points (low and high in turn). This means users won’t get side-tracked by lengthy menus or functionality that is simply not required. Designed with the user in mind, the monitors measure just 85mm x 50mm x 28mm (3.2in x 2.0in x 1.1in) and weigh just 76g (2.7oz) making the Clip and Clip+ non-intrusive and comfortable to wear. Information is available when needed in the form of an event log capable of storing up to 25 individual events, including self tests, alarm events, gas test and calibration detail. Events can be accessed either via the IR ink or C-Test gas (bump) test station and are stored in .csv format, ensuring data is provided in an easy to manipulate and understandable format. Fleet or safety managers also have the capability to change alarm points, ensuring compliance with changing regulations or company procedure. Attached to a wall, the C-test gas (bump) test station can be used to calibrate the detectors and also acts as a USB data storage and IR/USB set-up device. Alarm levels and gas test intervals can be changed using the IR interface or C-Test, ensuring implemented fleets can keep up with changing industry, regional or company regulations. Both the Crowcon Clip and the Clip+ are extremely robust and can operate in harsh environments over a temperature range of -40o to + 50o Celsius and in 5 to 95 per cent humidity, ensuring their suitability for the increasingly harsh environments monitors are required for. They are also IP66 and IP67 ingress protected for dust and water. The monitors have certification in the form of ATEX ll 1 G, IECEx Ex ia llC T4, CSA22.2 and UL913 to Class l Division l Groups A, B, C, D, ensuring they are suitable for the international market place.